In any case, we didn’t start the day planning to have a date-night-at-home. 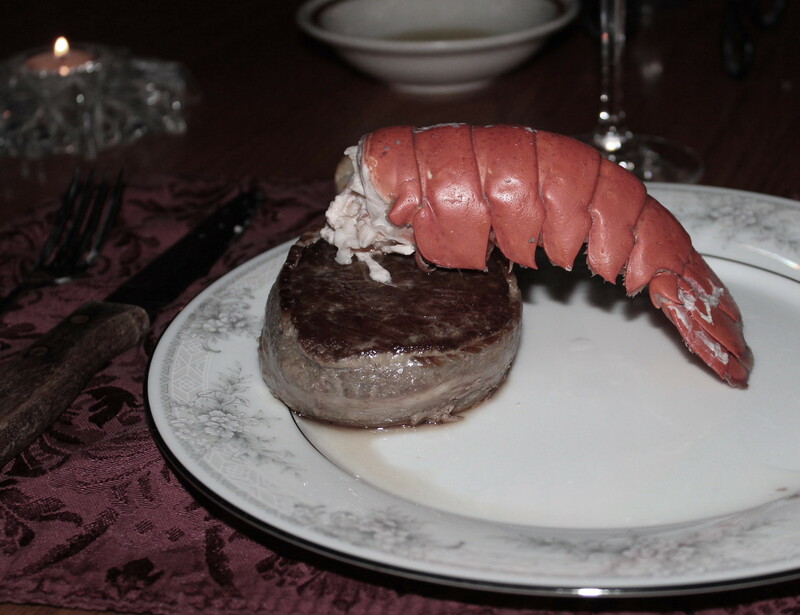 But as I was pushing past the frozen seafood case at Aldi, I saw two lobster tails slashed to half price–$9.99. instead of $19.99. I would never ordinarily impulse buy something like that, but something stopped the cart, pulled me backward, and into the cart it went. And half an hour later, at Gerbes, when I found filet mignon in the manager’s special case, I knew it was one of those lovely, unexpected gifts from above. We’ve never tried this before. We’ve never even done a candlelight dinner at home since…well, since Alex was a baby, at least. After nap we take the kids for frozen yogurt at Red Mango (holy cow, you need to try that place! ), and then we manage to survive a family trip to Staples, despite the yes-no-ing and the I-want-in-I-want-out-I-want-to-push-don’t-you-dare-push dynamics. Back at home, I snack on celery and carrot while feeding the kids. Then Christian takes them upstairs for baths while I begin putting things together. Caesar salad (hold on the croutons till the last minute). Skillet on the stove for the filets. Water and wine in a pot to steam lobster. China and crystal on the table. Candles. Candles? Wait a minute, all we have are purple & pink tea lights for the Advent wreath. Didn’t we have candlesticks once upon a time? I haven’t seen candlesticks in ages. I listen to the soundtrack of family life echo off the upstairs walls: Lean your head back. Michael, get away from the toilet! Alex, will you GET MOVING? At last I’m as ready as I can be. I go upstairs and help move the kids through the last of the bedtime routine. We read, we pray, we tuck children in, with admonitions to the boys to STAY IN BED tonight. We give Michael two long drinks of water. And then comes the perfect moment. The quiet–oh, the quiet! 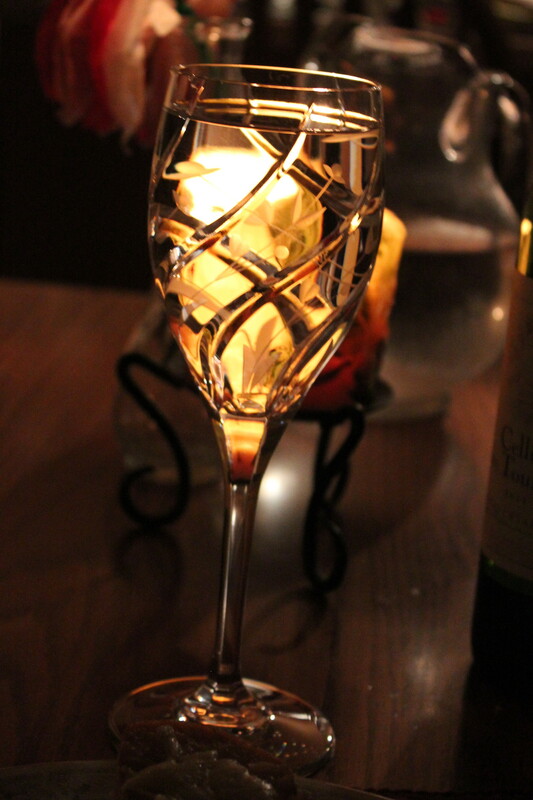 Candlelit quiet, quiet gleaming through fine crystal. The peace of sitting together, in our own kitchen, and eating dinner without leaping up and down a dozen times to fetch the sprinkles or pick up spoons hurled to the floor or cut up meat or arbitrate territorial disputes. Lobster and steak never tasted so heavenly. Afterward, we put on some classic music and sit together on the couch in the darkness, talking, not talking, listening, enjoying. We dance, as we did on our wedding night, to What A Wonderful World. And I wonder why we waited eight years to do this. And I make a silent promise to myself that it won’t be nearly that long before we do it again. Sounds wonderful (and delicious), glad you followed the signs to your in-home date night. A little night music….and you are two people who can appreciate an unexpected gift and miracle of sorts. Wonderful, thanks for sharing that. I was planning on greeting my wife when she returns from work with some BBQ steak and some nice time in the fresh quiet air… oh and I like destructicon, it works. Your wife will be thrilled! Sounds lovely.